RELaTED project meeting in Tartu. RELaTED project partners have recently attended their scheduled appointment, this time in Tartu, Estonia. Tartu is one of the four demonstration sites where RELaTED Ultra-Low Temperature concept is being implemented. 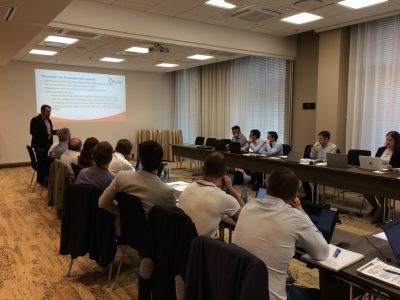 RELaTED project partners meet in Tartu to discuss their progress in developing Ultra-Low Temperature concept and to define the next steps to follow. The meeting continued with a study visit of the Fortum Tartu CHP plant part of the low temperature district heating demonstration site in Tartu. This plant uses local biofuels – woodchips and peat to produce electricity and heat. The heat is delivered though district heating network for more than 75% of Tartu’s residents. Finally, RELaTED partners visited the cooling complex of the Estonian National Museum (ERM). The museum has been supplied with a cooling complex coupled to its DH system. Tartu is one of the four demonstration sites where the RELaTED concept is being implemented. With over 90.000 inhabitants, Tartu is the second largest city of Estonia. Also it has one of the operational district heating network with larger share of renewable energy sources, mainly biomass. Yearly 500GWh are delivered to over 1500 customers and 72,000 end users in the city, most of this energy is obtained from biomass, green fuel or biofuel (ground peat, wood chips and wood waste). This has essentially reduced the hostile emission to the environment of greenhouse gases, keeping the air of the city of Tartu and its surroundings clean. 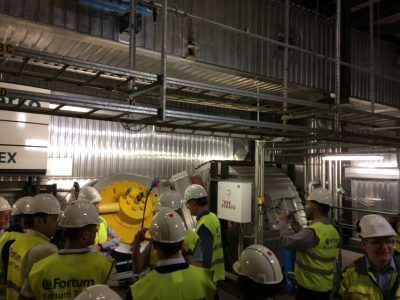 RELaTED partners visited Fortum Tartu CHP plant. RELaTED project partner Fortum Tartu is the energy producer that serves this city, by a district heating system privately owned. Fortum Tartu and its subsidiary AS Keskkatlamaja have a production capacity of 250MW, comprising Biomass CHP systems, Biomass and gas boilers, and heat pumps systems connected to over heating and cooling network. ULT conversion of the TARKON-TUGLASE DH network area comprising 54 consumers totalling 4,3MW with a network length of 4.6 km. Technical limitations of the DH network will be investigated, and associated feasible technical and economically viable conversion scenarios identified. Development of a heat purchase strategy from one or several industrial waste heat producers with an estimated power of 0.5 to 1 MW. Connection of excess heat from cooling applications to the DH network. Connection of waste heat sources and excess heat from bio CHP as heat sources for desiccant cooling plants in summer.